A large operating envelope make them ideal to reach jobs high and low with self-leveling outriggers. These towable booms are either gas powered with a 9 HP engine or have 24V DC electrical power. 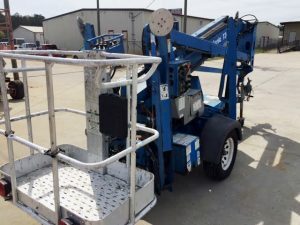 Can be easily towed with a standard pick-up truck and have either a 2 inch ball, 2 and 5/16 inch ball or a pintle hitch, allowing for quick delivery to the job site. 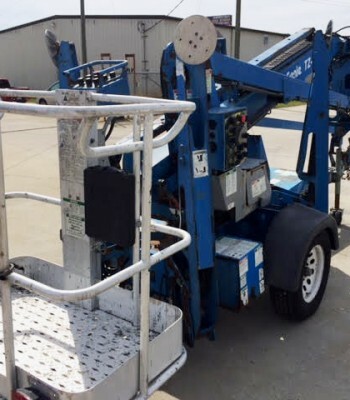 Width of these tow-able/trailer booms range from 4’9″ to 5′ 7″ and platform size range from 26.5 to 30 inches and length is 44 to 48 inches depending on make and model. Most common uses are tree trimming, decorating, construction, exterior painting or various maintenance jobs.